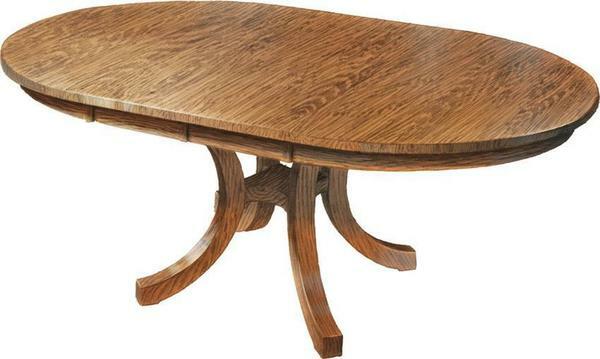 Featuring smooth, flowing curved lines, this Amish Carlisle Shaker Dining Table has a graceful feeling blended with the traditional Amish touch of solidity. Think about selecting a quartersawn white oak to reveal finer lines and wood grains reflective of an authentic turn-of-the-century craftsman technique rarely found in our modern world. If you're looking for a solid wood Shaker dining table that is made in America, it just doesn't get any better than DutchCrafters! Top of Leg: 3" x 3"
Bottom of Leg: 2" x 2"
The table is well constructed, attractive and well designed mechanically. One person can extend the table and insert the leaves if needed (although it's always easier with two people). The custom stain does indeed match my floor well. Great job! The table arrived yesterday. You know, given the reviews we had read, our expectations were pretty high. Well, as I told my wife when I had set it up, it was more beautiful than I had imagined and when she got home, she was in total agreement. What a stunning piece of furniture - we are thrilled! We aren't in the need of anything right now, but you can be sure you'll be first on our list to call and we will recommend you to friends who are in the market. We have friends coming for dinner Friday night to help us break it in! We want you to know that we are delighted with our table! It's everything we hoped for and the service from Dutch Crafters was terrific. Thank you so much!